In memory of Zelda, who will be missed. 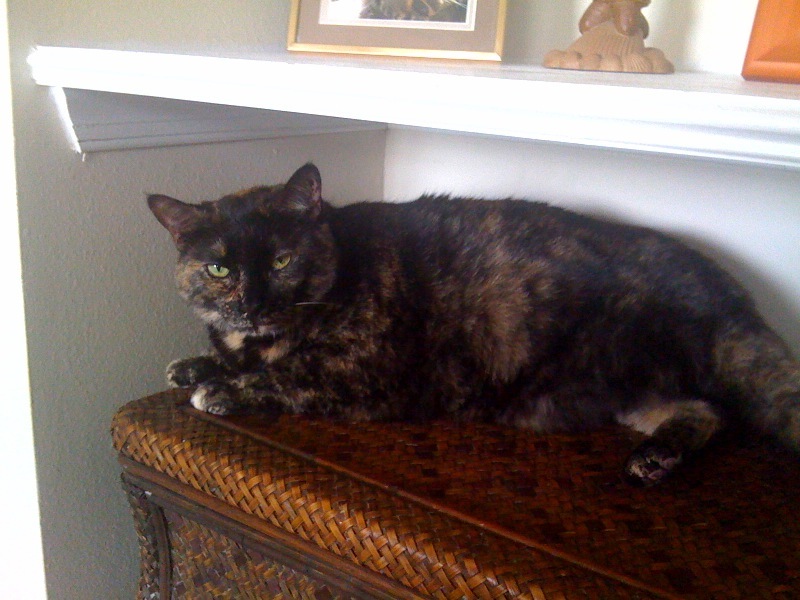 Our Zelda was a wonderfully nurturing, sweet-tempered girl, except when she wasn't; we did call her the Queen of All Evil, after all, but all torties have tortitude, and Zelda's was strong. She died in my arms at the vet last night, warm and purring. She went peacefully after an excellent day spent in her bed by the fire when she wasn't enjoying meals of baby beef and jarred tuna packed in oil. I will miss her strident meow, her thunderous purring, and the warmth of her body and spirit. Zelda was a good cat and a better friend, to us and every other cat she encountered while deigning to live with us, and I will always treasure the time we had together. I am so, so sorry for your loss, Iuls! "Deigning to live with us" is the best cat description! My condolences on the passing of the great queen Zelda. Sorry to read this. It is so difficult letting family go. I am sure she was comforted being in your arms at the end. I am truly sorry this happened. I hope there's a special place in heaven with enough scratching posts and cat food. I am sorry for your loss. There's a special kind of love when a torti picks you as their human! I'm so sorry about Zelda. as much as you loved her.